McSweeney Langevin is providing free legal consultations to individuals who were implanted with hernia mesh and suffered complications relating to the hernia mesh. If you have been injured by hernia mesh, call 1-877-542-4646 or use our private contact form for a confidential legal consultation. A hernia occurs when an organ, intestine or fatty tissue squeezes through a hole or a weak spot in the surrounding muscle or connective tissue. Hernias often occur at the abdominal wall. Sometimes a herniacan be visible as an externalbulge particularly when straining or bearing down. There are non-surgical and surgical treatments for hernias. One of the most common surgical treatments is with mesh. 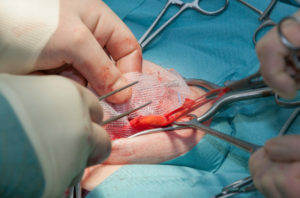 Hernia mesh is made out of either synthetic or animal-tissue based materials. What type of side effects are individuals experiencing as a result of hernia mesh? Want to find out if you or a loved one has a hernia mesh claim? Please feel free to contact a hernia mesh attorney using the form below or by dialing 1-877-542-4646. One of our experienced hernia mesh lawyers will help evaluate your claim and explain your legal rights for free. McSweeney / Langevin is providing consultations to individuals throughout the United States. Information provided by email or phone will be kept confidential.